This blog is the second in a two-part series about using feedback from rural Arizonans to improve climate change adaptation research in the region. In my last blog, I wrote that discussions with many groups of rural Arizonans revealed that they are highly aware of and concerned about changes that are occurring in our weather and climate, and that they already are engaged in adaptation efforts. What to do with that information? We used qualitative methods to analyze the group discussions, and then developed a model of rural Arizonans’ approach to climate change adaptation. Table 1 illustrates this model by categorizing activities that participants brought up in discussion. The left column lists activities that reveal how local residents adjust their activities to the climate, an approach we refer to as “living with the climate.” The right column lists activities which participants brought up as examples of disregard for the climate. These reflect an approach to adaptation we refer to as “overcoming the climate,” a concept of engineering the environment so that human activities can take advantage of positive aspects of the climate while being buffered from negative aspects. This logic ignores the interdependence of human society and nature that “living with the climate” addresses. Table 1: Living with the climate. This contrast helps to bring out several important aspects of a particular local approach to adaptation that are extremely important for climate change adaptation researchers and policy-makers to keep in mind in order to be able to recognize and support a wide range of locally relevant adaptation strategies. First, in “living with the climate,” human society and nature are seen as intertwined: what happens in each affects the other. Second, “living with the climate” depends primarily on situated knowledge acquired through local practice and experience, while “overcoming the climate” is based primarily on scientific and technical knowledge that follows rules that can be formally taught and applied anywhere. A final difference between these two approaches to adaptation is one of values and attitude. “Living with the climate” is motivated by attachment to place and rural values, and is undertaken with an attitude of humility in the face of uncertainty, while “overcoming the climate” is motivated by an ideology of economic maximization and confidence in the efficacy of science and technical expertise. Given their concerns about the climate changes they are experiencing, discussion participants had many suggestions about what could be done to live with them. 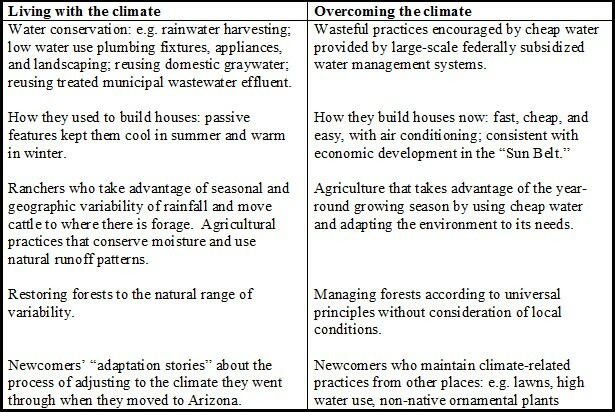 We used their suggestions to extend “living with the climate” to a model of their approach to climate change adaptation, which we refer to as “living with climate change.” Many of the suggestions build on their ideas about “living with the climate” and attempt to extend it to higher levels of social organization and longer time frames using the same five underlying characteristics identified above. These characteristics are summarized in the left column of Table 2. Table 2: Living with climate change versus adapting to climate change. An understanding of these underlying characteristics also helps us to see some of the underlying characteristics and the potential effects of the expert understanding of climate change adaptation. The Intergovernmental Panel on Climate Change (IPCC) Third and Fourth Assessment Report defines adaptation as: “the adjustment in natural or human systems in response to actual or expected climatic stimuli or their effects, which moderates harm or exploits beneficial opportunities.” We refer to this conception of climate change adaptation as “adapting to climate change,” with an emphasis on the “to.” These underlying characteristics bear some similarities to those of “overcoming the climate” and are summarized in the right column of Table 2. The contrasts between the underlying characteristics of “living with climate change” and “adapting to climate change” suggest that adaptation planning and support based on the latter may not have the breadth and flexibility to recognize and support a wide range of locally relevant adaptation strategies. By pointing out these contrasts, we do not mean to suggest that these are opposing, good-bad, rural-urban, autonomous-planned, or small- versus large-scale approaches to adaptation. Nor do we mean to suggest that “living with climate change” is the preferred alternative to “adapting to climate change.” Rather we wish to suggest that the former helps point the way toward a more comprehensive understanding of climate change adaptation based on recognition of the nature-society mutuality, which encompasses and integrates situated and abstract knowledge, performance and planning, adjusting human activities and engineering the environment, and non-economic and economic values, and recognizes when each is appropriate. And because neither “living with” nor “adapting to” incorporates the possibility of transformation of the biophysical or social environment, a more comprehensive understanding should also recognize that possibility. The term “Anthropocene” was first proposed to describe the current geological epoch by atmospheric chemist Paul Crutzen and biologist Eugene Stoermer in 2000 in recognition of the major and growing impacts of humans on the earth and atmosphere at all scales and “to emphasize the role of mankind in geology and ecology.” While climate change is perhaps the most prominent among the physical phenomena that have forced this conceptual shift, the preceding discussion reveals that the dominant approach we are using to understand climate change adaptation is still based on the separation of ‘nature’ and ‘society’ at the underlying level of our understanding of the nature of being and knowledge. We hope that our research will contribute to the development of new approaches to understanding and supporting climate change adaptation in the Anthropocene.